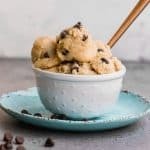 This edible cookie dough recipe is Gluten-free and made with absolutely NO eggs and ready in less than 10 mins. In a mixing bowl, stir together the dry ingredients (except chocolate chips). Add in the melted butter and stir until combined. Add in the milk starting at 1/4 cup and stir until a dough forms. For a creamier cookie dough, add another 1-2 tablespoons of almond milk. Fold in chocolate chips. Chill and serve.